Professional Development is more than just workshops, readings, and online courses. So what is it? And why am I dissatisfied with PD being reduced to these usual components? I think I have rewritten (and rethought) this post more than any other. My earlier thinking is posted here, and here. Why reframe it again now? I think I finally figured out what it is that makes us (Auburn Schools) think differently about professional development. We aren’t interested in simply sharing techniques or information. We want changes in classroom practice. 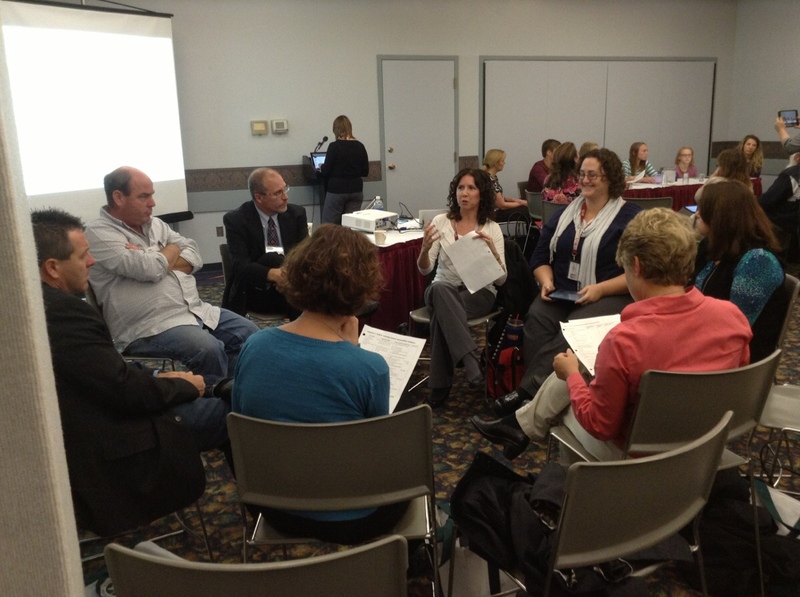 I have collaborated with other districts and initiatives, and I hear frustrations about how much they have invested in professional development – how many sessions they have provided – and how it has resulted in very little change in practice. I think it is because our thinking about professional development has been incomplete. Sometimes folks say that teachers are oppositional or unwilling to change, but I think it is that workshops are simply insufficient (and perhaps their role is misunderstood), even though they are a key component. Over time, our understanding about what we need to pay attention to in terms of PD and support has expanded to include 3 overarching categories: clarity; support for foundational knowledge, and support for achieving proficiency. A Professional Learning Curriculum – If we have an initiative (technology integration, proficiency-based learning, math instruction, middle level practices, what ever it may be…), what do we want our educators to become good at? As with young learners, adult learners can excel when we are transparent about what we would like them to know and be able to do. What are the (clearly articulated) knowledge and skills we want our educators to become proficient in, and what scopes and sequences make sense? A Professional Learning Progress Management System – How will we manage, acknowledge and certify adult learning (just as we should for student learning)? What system(s) will we use to help make the professional curriculum and pathways transparent, to certify teacher proficiencies as they move through their professional curriculum, and to record and manage their “certifications” (micro-credentialling, “badging,” Educate/Empower or other learning progress management systems)? Answering “But What Does It Look Like?” – Simply stated, this is “models & examples”; a curated collection of possible documents, classroom visits, videos, photos, and articles, etc., to help teachers develop a sense of what an aspect of the strategy would look like in action. Teachers often have an intellectual understanding of what they are being asked to do, but not a practical understanding. These models and examples play a critical role in helping them move to the point of being able to try this new idea in their own classroom. “Same Page” Trainings – These are introductory workshops, getting teachers on the same page about a new set of concepts, skills, or strategies they will be working to implement. We used to think of teachers as leaving a workshop as proficient in the new skill. Now we think of these “same page” sessions as just the beginning. The real (professional) learning happens when they go back to their classrooms and try out the strategy (see the PD components in the next category). Reusable Learning Objects – Instead of having to wait for a workshop, or for the Tech Integrator or Instructional Coach to visit her classroom, these how-to articles, lessons, short courses, videos, and other digital resources (aligned to our professional learning curriculum) are available to a teacher as she needs them. Lesson Invention and Tryouts – There is much to any new system that needs to be designed or invented (or at least adapted for our schools). The work teachers do to design, invent, prototype, refine, perfect, and share these systems and strategies is valuable professional learning for all of us. Even relatively simple ideas or strategies, if they are truly new to a teacher, require some level of “invention” for that educator to put them into action. Embedded in the idea of lesson invention and tryouts is the notion of continuous improvement, and the chance to try a skill in the classroom, reflect on how it went and how it could be done better, and then try it out again with the improvements (play-debrief-replay). Coaching and Feedback – Keeping with the idea of continuous improvement, this includes the teacher working with any Technology Integrator, Instructional Coach, administrator, or peer, who models lessons or strategies, co-designs or plans with the teacher, observes, and/or provides formative feedback to support the teacher’s professional growth and ability to increase the level of fidelity with which they can implement the strategy. Teacher Face-to-Face Time – Teachers need time to sit with other teachers working on the same initiatives to share experiences, ideas, and resources, as well as to ask questions and seek support. They need a chance to share things that they have tried that worked, and to seek assistance with those things they are still challenged by. And the notion of “face-to-face” can extend well beyond her school or district via the blogs and social networks the teacher builds and follows. We don’t just see that there are 3 categories of professional learning, but we acknowledge that all three compliment each other and are needed. Teachers don’t get to proficiency without the foundational supports. To offer workshops without defining the desired broader professional learning at best leaves gaps in teachers’ learning and at worst becomes a collection of random workshops. To share a set of expectations with teachers (the professional curriculum) without providing training and supports is the irresponsible expectation that they can change practices without supports. Successful changes in classroom practice come when there is clarity, as well as support for both building foundational understandings and growing to proficiency. If your initiative isn’t progressing the way you would like, if you aren’t seeing the the classroom changes you’d like to see, I’d invite you to look at the strategies within the three categories. Is your initiative attending to each? This entry was posted in Customized Learning, Distributed PD Project, Professional Development and tagged Continuous Improvement, Educate (Learning Progress Mngmt System), Supporting Teachers on September 21, 2014 by Mike Muir. We’ve been thinking a lot lately about professional development. We’re working on a comprehensive project to define a professional learning curriculum related to our strategic initiatives (Customized Learning, Tech for Learning, etc), build modules and professional learning playlists around those learning targets, and provide a system for certifying teachers for their accomplishments and for what they know and can do. And I have written before about how our thinking about professional development has evolved over time. This post captures our current (Summer 2014) thinking on the topic. Not only are we recognizing that we just don’t have enough resources and opportunities to do traditional “everyone in the same room” professional development, but we have started thinking differently about the purpose of those workshops and other whole-group PD. Until recently, I used to think of whole-group PD as the end. Teachers attend the PD session and they would leave being proficient at the skill taught in the session, ready and able to implement it well in their classroom. Now, I think of whole-group PD as just the beginning, an opportunity to introduce a group to a new idea and get them all “on the same page” before they begin working in their own classrooms at learning how to implement the skill well. This is especially important given that the work we’ve been doing lately around Customized Learning, including teaching with iPads, is new to teachers (they haven’t experienced this themselves as learners) and have to invent many of the pieces. And that idea, the idea that these new skills are complex, and need inventing and development, and later need practice, and that teachers need to be supported throughout their work to get good at them, has us thinking about workshops as just one small piece of professional development. “Same Page” Trainings – These are introductory workshops, getting teachers on the same page about a new set of concepts, skills, or strategies they will be working to implement. Lesson Invention & Tryouts – There is much to this new system that needs to be designed or invented (or at least adapted for our schools). The work teachers do to design, invent, prototype, refine, perfect, and share these systems and strategies is valuable professional learning for all of us. Embedded in this idea is the notion of continuous improvement, and the chance to try a skill in the classroom, reflect on how it went and how it could be done better, and then try it out again with the improvements (play-debrief-replay). Coaching & Feedback – Keeping with the idea of continuous improvement, this includes any Technology Integrator, Instructional Coach, administrator, or peer who models lessons or strategies, co-designs or plans with the teacher, observes, and/or provides formative feedback to support the teacher’s professional growth. Teacher Face-to-Face Time – Teachers need time to sit with other teachers to share experiences, ideas, and resources, as well as to ask questions and seek support. They need a chance to share things that they have tried that worked, and to seek assistance with those things they are still challenged by. And the notion of “face-to-face” can extend well beyond her school or district via the blogs and social networks the teacher builds and follows. On-Demand Modules & Play Lists – Instead of having to wait for a workshop, or for the Tech Integrator or Instructional Coach to visit her classroom, these how-to articles, lessons, short courses, videos, and other digital resources are available to a teacher as she needs them. Answering “But What Does It Look Like?” – Simply stated, this is models & examples: a curated collection of possible classroom visits, videos, photos, and articles, etc., to help teachers develop a sense of what an aspect of the initiative would look like in action. Teachers often have an intellectual understanding of what they are being asked to do, but not a practical understanding. These models and examples play a critical role in helping them move to the point of being able to try this new idea in their own classroom. And critical to making these six components of professional learning work well is that we are explicit and transparent about the professional learning we are seeking from our teachers, and that we develop a way to certify and credential (micro-credentialling/badging) teachers in what they know and can do. Of course, now we have to figure out how to do all of these well…. This entry was posted in Distributed PD Project, Professional Development, Uncategorized and tagged Positive Pressure and Support, School Change, Supporting Teachers on August 9, 2014 by Mike Muir. We’re working on a project to get more professional development to more teachers as they need it. Two pieces that we mention frequently are reusable learning objects (including online modules) and digital badges. We do that, in part, because they may be the most interesting aspects, especially when trying to spark other educator’s interest and entice them to join us in the effort. Now, I know they are well intentioned (these are good people, I like working with), and just trying to help (why reinvent the wheel, right?). But the suggestions totally miss the point of what we’re trying to achieve with the project. My first question to them probably should have been, “What are your criteria for selecting these resources?” In all fairness, although familiar with the type of resources, I haven’t spent real time looking at these specific ones, and I haven’t asked my colleagues this question. But I suspect that their answer would be, “They have lots of PD resources that our teachers would like or find useful, and they have badges.” And I’m sure there would be at least some resources there helpful to us and our work. But our goal is not simply to provide a buffet of PD, nor is it to simply have a badge at the end. In fact there are three key ways that these resource suggestions misunderstand our work. There are three key, distinguishing criteria we should apply to any resources or services we select to support this project. 1) We don’t want just any PD. We want targeted training aimed at supporting teachers as they work to implement our strategic initiatives (Customized Learning, Tech for Learning, etc.). We’re building out that professional learning curriculum so that we can be transparent about what we would like teachers to know and be able to do. So one criterion we’d want is for a high level of alignment between the training modules and the knowledge and skills needed for our initiatives. A question I could ask about the suggested products is, “How does the list of available modules match our professional learning curriculum?” Keep in mind that a subscription service might not meet that criterion, but still have tons of high quality modules, just not the ones that we really need. And that is ok. We are quite happy to build out our own modules and playlists of available reusable learning objects. But those will be targeted directly to our professional learning curriculum. 2) We aren’t looking for badges that show that an educator participated in a training. We’re looking for badges that indicate that the educator is proficient with the professional learning target. If the training module were for something like standards-based grading, for example, we would want the teacher to earn the badge when she demonstrates that she is skilled at analyzing student work for how it demonstrated proficiency, is skilled at providing standards-based feedback to students, and is skilled at rating a student’s level of proficiency in that learning target based on evidence from the student’s work. We are not looking for the badge to be awarded when the educator participated in the training. So a second criterion we’d want is for badges to be awarded only when a teacher can show that she is skilled at or understands a particular professional learning target. A question I could ask about the suggested products is, “Are badges awarded for demonstrated proficiency?” This is why, in some ways, the professional learning curriculum and having a cohort of qualified certifiers to examine the teacher’s evidence and determine when she has earned a badge may be more important than finding good training materials. 3) We don’t want badges just so we have an icon to show that we did something. The image or patch of the earned badge may be the least important aspect. As I mentioned in notes from a forum on digital badges, badging is about credentialling. It’s about recognition, knowing something about someone in a verified way (evidence-based way), and represents an individual’s skills and achievements. Badges travel with the individual (do not reside solely within a single platform or system) and can come from a variety of sources – a badge needs transportability and interoperability. As such, badges need a standard. Such a standard supports their use by the folks who issue them, the folks who earn them, and the folks who are interested in which badges you have. This entry was posted in Distributed PD Project, Learning Progress Management, Professional Development on August 5, 2014 by Mike Muir. One aspect of our Distributed PD Project is credentialing: thinking about how we might acknowledge what teachers know and can do and giving them “credit” for the new things they are learning. One way we’re looking to do this is through digital badges. 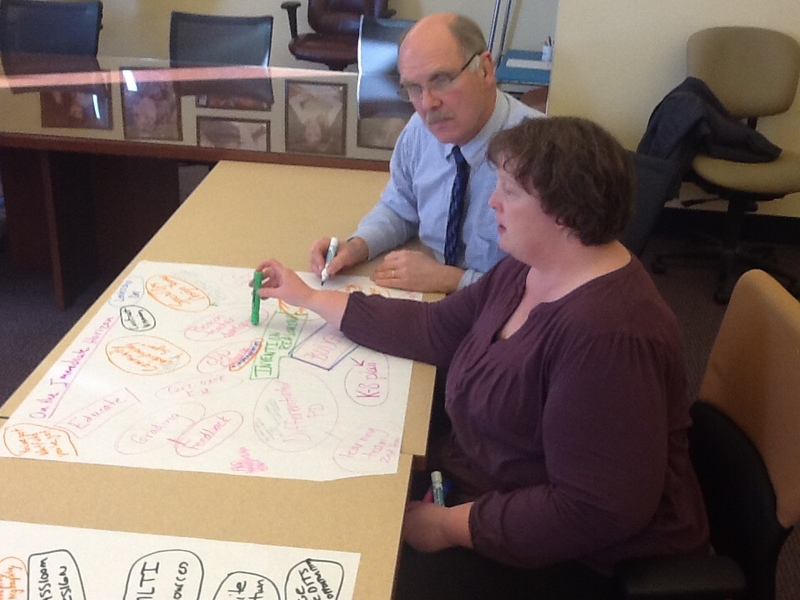 On April 30, 2014, I attended Open Badges: Re-imagining Credentials for the Digital Age at the University of Southern Maine. The session featured Erin Knight, the Executive Director of the Badge Alliance. Below are my notes from that session (Apologies if they seem cryptic. I just copied them here and didn’t enhance or clarify them much…). Are the commercial providers (Blackboald, moodel, etc.) building their badges in such a way that folks can use them in other platforms/ecosystems? Think of the large badges as “Paths” (code school or P2PU). Or would this be the Phases of Implementation? What does the ecosystem idea tell us about how we define our system? The ecosystem ideas means that teachers should be able to earn their badges anywhere… Does that mean that we should define our medium and large badge requirements generically and point to our own badges that might fulfil that requirement??? Reimagining credentials for a transformed culture of learning. Open Badges are a new way to think about recognizing and connecting learning and skill development. Digital, information-based, and stackable badges are becoming a new currency for skills, identity, and jobs. In this presentation, Erin Knight, Executive Director of Badge Alliance, will explore the state of the work so far, with examples of where badging is being successfully used across the ecosystem, as well as opportunities for higher education institutions to leverage badging within their own systems for their own benefit. This entry was posted in Distributed PD Project, Learning Progress Management on August 1, 2014 by Mike Muir. As we think about our teachers becoming highly skilled at teaching and learning with iPads, we could certainly generate a very long list of skills, approaches, tools, apps, strategies, and other competences we'd like them to get good at. But if we consider how we might group that very long list into categories, I think we have 10 buckets that would make up our professional learning curriculum. Three of those buckets focus on teachers' being able to use the technology themselves and create the conditions in the classroom for students to use the technology for learning. Personal Use: Can teachers use the device themselves as their own productivity and learning tool? Classroom Management for Tech: How can teachers insure that students are focused and on-task when using technology in the classroom? 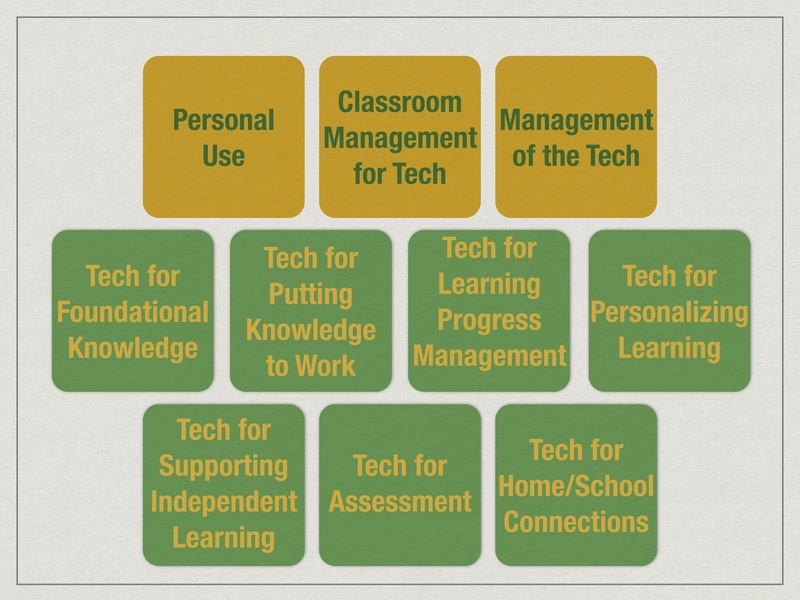 Managing the Tech: How do teachers organize the technology (or collaborate with students to organize the technology) so it works and is available to be used for learning in the classroom? This entry was posted in Distributed PD Project, Doing 1to1 Right, Professional Development and tagged Auburn, Distributed PD on May 6, 2014 by Mike Muir. Auburn Schools is starting a new project: the Distributed PD Project, working to support teachers leveraging iPads for teaching and learning. The project includes establishing a professional learning curriculum, modules to delver that curriculum and Digital Badges to acknowledge and document learning. This entry was posted in Distributed PD Project, Professional Development and tagged Aubschl, Distributed PD on February 5, 2014 by Mike Muir.